Massive methane release from thawing permafrost and undersea sediments is one of the best known Climate Tipping Points, featuring in news stories and scientific reports and triggering fears by some of ‘runaway‘ warming. Methane is a potent greenhouse gas which is around 34 times as powerful as carbon dioxide over ~100 years, and so a rapid release of methane could significantly amplify global warming. But are there methane tipping points, and how close might we be to them? There are two main sources of methane that scientists are worried about: methane trapped in ice below the seafloor (known as ‘Methane Hydrates’ or ‘Clathrates’), and methane generated by the thawing and decomposition of Permafrost. Huge areas of soil around the Arctic are frozen all year round and so are known as permafrost. As these areas are so cold any organic matter that accumulates from plants tends not to rot, gradually building up thick soils known as ‘Yedoma’ that are full of organic carbon. These soils may contain as much as nearly twice the carbon which is currently in the atmosphere. 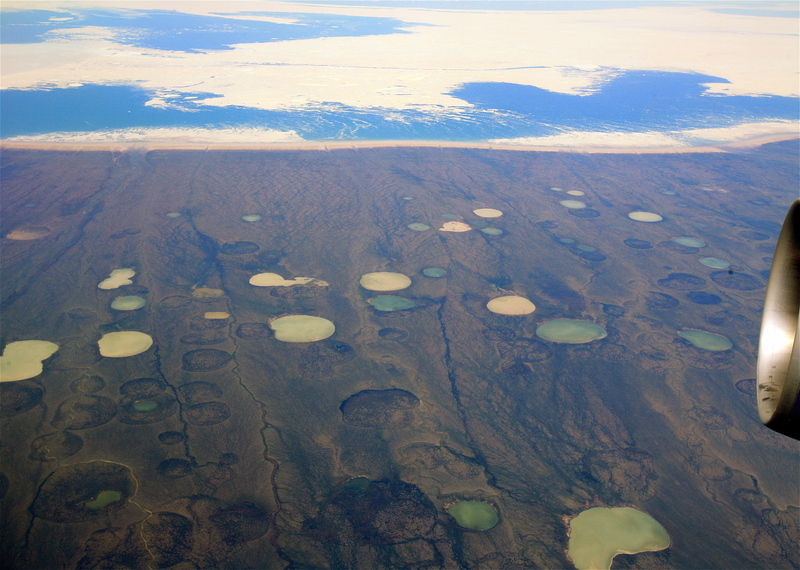 But global warming has started to melt some of this permafrost, and once it begins to melt microbes can begin to decompose the organic matter, which generates heat (which amplifies the melting) and methane as well as surface slumps. This has led to craters appearing in Siberia, ancient microbes leading to smallpox and anthrax outbreaks, and damaging roads and buildings in Alaska. The last time the Earth warmed up by ~1.5 degrees celsius large areas of permafrost melted, and as this is likely the minimum warming humans will cause it is very likely we’ll see a lot more permafrost thawing this century. Methane hydrates occur in sediments both on land and the seafloor, and are made of methane molecules from rotting organic matter getting trapped within ice crystals. It looks just like ice, but it can catch fire! Methane hydrates can only form at very specific temperatures and pressures, and warming can destabilise them and cause the methane to be released. Burning Methane Hydrate with molecular structure inset. Methane bubbles coming from destabilising clathrates have recently been spotted off the coast of the Arctic Svalbard islands, and there will be more to come as the ocean gradually warms up in response to global warming. It’s also been hypothesised that methane hydrates may have caused rapid global warming before, during the very warm ‘PETM‘ event 55 million years ago. Both of these methane sources are vulnerable to the effects of Arctic sea ice loss triggering rapid Arctic warming- another Climate Tipping Point discussed in a previous blogpost. The Arctic is warming up much faster than the global average as sea ice retreats, and this is warming up regions with large permafrost and methane hydrate deposits. This would speed up methane release from these deposits, which would add to global warming and therefore Arctic warming in a positive feedback loop, making Arctic methane another potential Climate Tipping Point. So how worried should we be? Some campaigners are so concerned that they’re advocating emergency geoengineering to “cool the Arctic”. However, most climate scientists are not panicking yet, pointing out that the estimated contribution of permafrost methane to global warming is much smaller than human-driven carbon emissions and that the leakage won’t be as quick as feared. The PETM may not be a clear-cut example of methane hydrates rapidly destabilising either – recent research suggests the methane might have escaped into the sea more slowly. Although methane tipping points may not be as catastrophic as has been feared, passing these imminent tipping points will still trigger the steady release of methane from permafrost and methane hydrates and will help to amplify global warming in the coming centuries. Next Can Tipping Points have Early Warnings? what danger threatens if methane gas is inhaled by human? Hi Sofyana, methane is an asphyxiant like carbon dioxide, as in high concentrations it displaces the oxygen you need to breathe. At low concentrations it’s unlikely to have any effect on humans, and the amount that could be released from e.g. melting permafrost wouldn’t be enough to cause any health issues. Even at low concentrations though methane is a potent greenhouse gas, so even if it’s too low a concentration to directly affect humans it can still indirectly affect us through its global warming impact. Santa’s gonna have to find another place to live because the North Pole will be a sea lane before long!